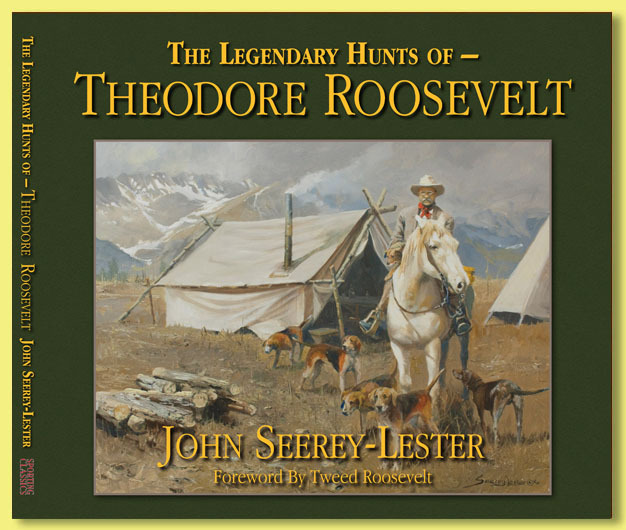 In this book Seerey-Lester recreates in words and paint some of the most incredible experiences of one remarkable man. You will share TRs frustration of being a rancher and the thrill of being an explorer and big game hunter. You will be there, as the president becomes the first white man to witness the Maasai Warriors rite of passage in Africa; you will share in TRs fear during a bear attack and read about his amazing hand to claw combat with a world record cougar. After reading these, more than 50 stories that begin when TR was just 17 years of age, you will realize that no man in recent history ever experienced as many life-threatening incidents. 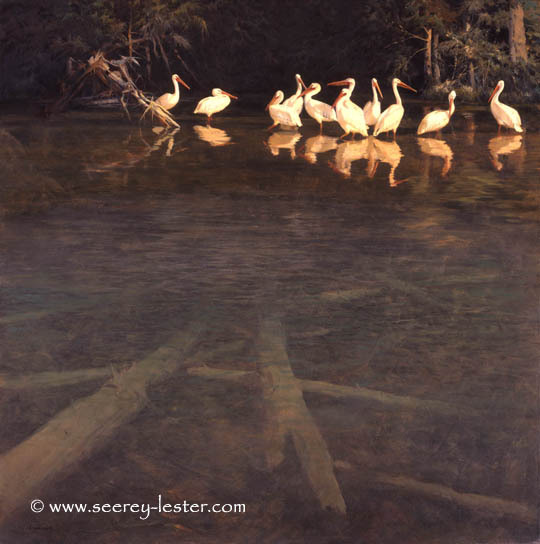 Seerey-Lester has captured many of these in his paintings and in the retelling of the stories behind the episodes. You will see that TR was driven by ambition but also tragedy, and read about the incidents, which led to him becoming the youngest man to become President of the United States. How he managed to balance public life with his desire to hunt and preserve the natural habitat of his beloved America. 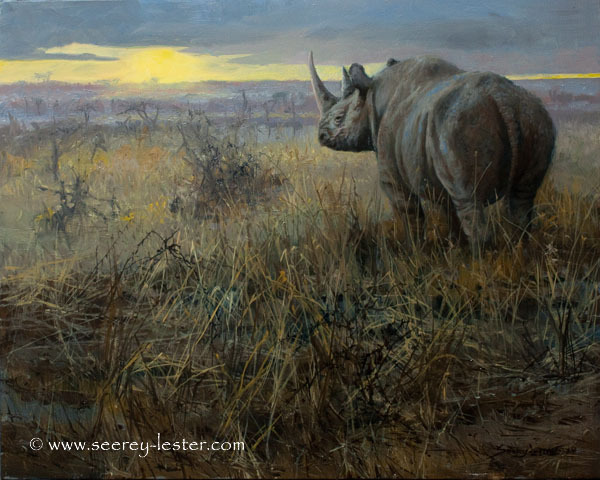 Seerey-Lester deals with those two sides of TR with compassion and understanding. Some 18 stories are devoted to this historic venture on the Dark Continent, the difficulties of hunting and preserving big game specimens; life and death incidents to which ultimately turned out to be controversial. 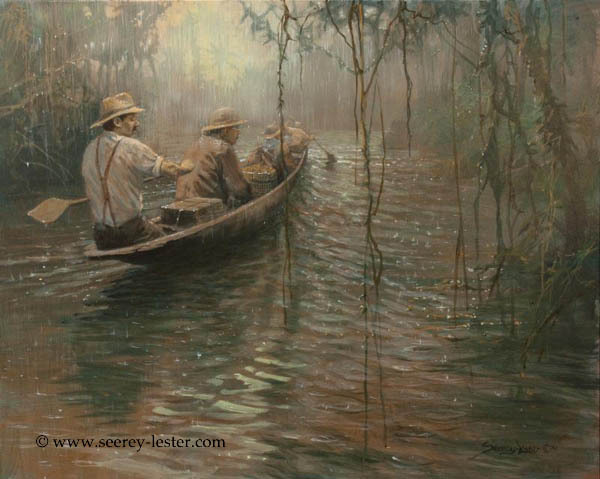 The Book continues with his hazardous expedition down the River of Doubt in Brazil, and then concludes with expeditions undertaken in the Far East by his sons, Kermit and Ted, proving that the TR tradition continued after his death. This is a depiction of one event from Theodore Roosevelt's expedition down Brazil's River of Doubt. 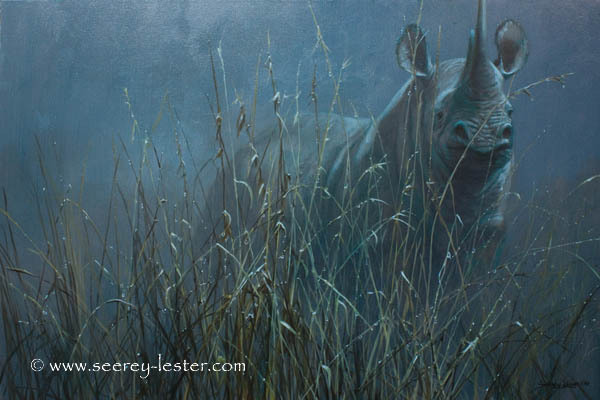 This painting, along with the complete harrowing story, will be featured in The Legendary Hunts of Theodore Roosevelt. The tale of Roosevelt's terrifying saga down Brazil's River of Doubt is featured in The Legendary Hunts of Theodore Roosevelt. This painting will be among some 120 paintings in the new book. 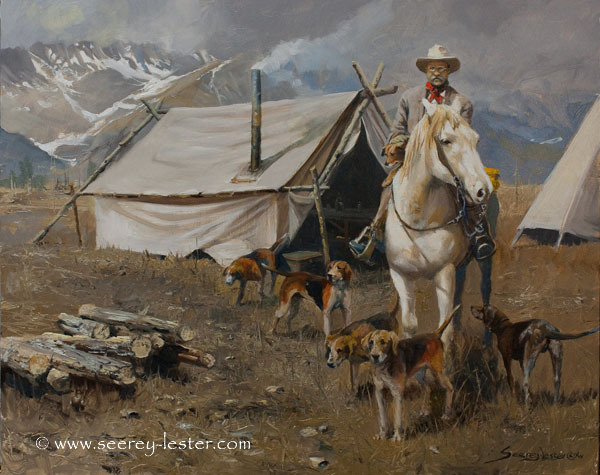 Theodore Roosevelt and one of his dogs, Shorty, which he hunted with in Colorado in 1905. The full story appears in the new book. 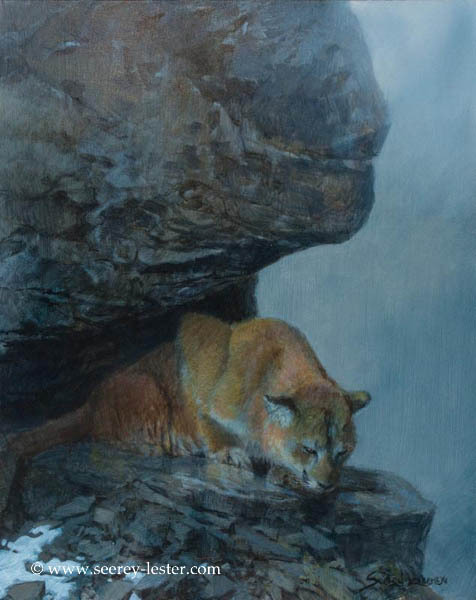 In 1901, when Theodore Roosevelt was still vice president, he went to great lengths to get a cougar. He asked his companion, Goff to grab his ankles and lower him over the edge of a cliff, so he could get his shot. See the full amazing story in John's new book. 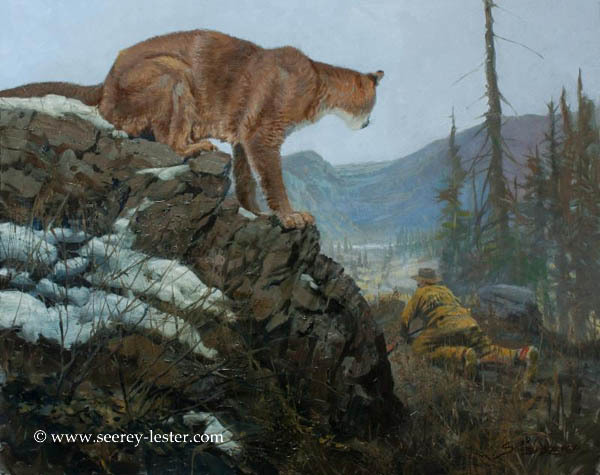 In 1889 the young Theodore Roosevelt was unaware that a cougar was watching him. Find out what happens next in John's new book. 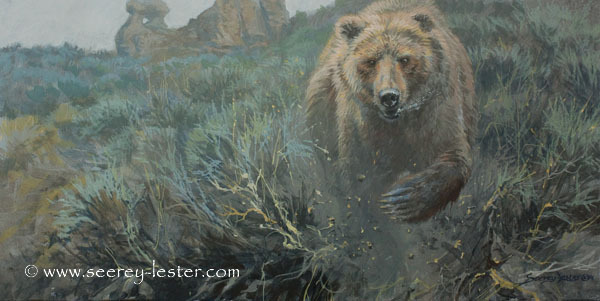 During a hunt at Red Rock Pass in Idaho in 1889, Theodore Roosevelt was nearly killed by a charging grizzly. 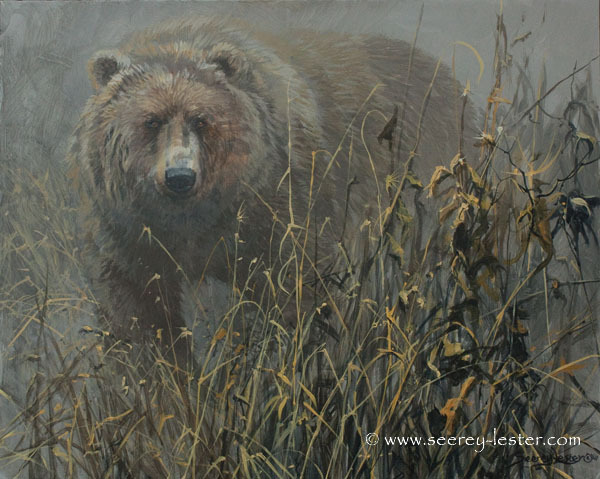 In 1889, Theodore Roosevelt had a near death encounter with a relentless grizzly. Read the full story in John's new book. John re-worked his painting "Black Rain". The new painting is called "Black Night" 24"x36" oil on canvas. It is scheduled to appear in his new book. 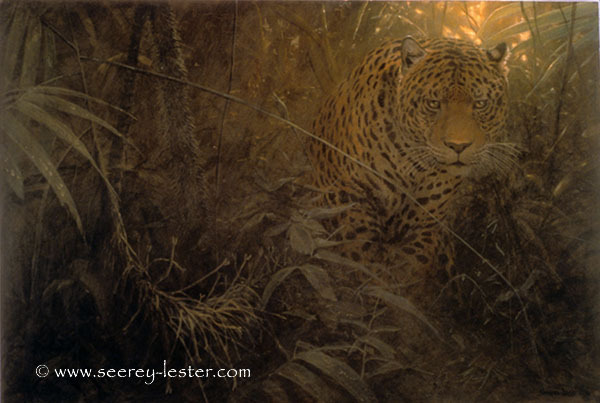 This painting by John of a black (melanistic) and a spotted jaguar, is Desert Moon, a 36"x18" acrylic on panel.. It is scheduled to appear in his new book along with a story about the River of Doubt. 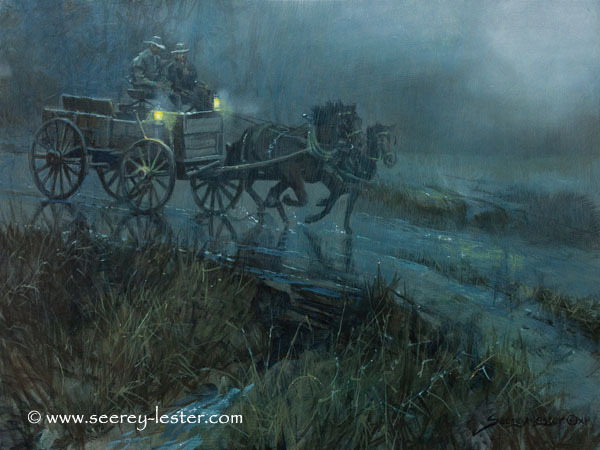 This painting will appear on page 83 of John's new book accompanying a story which tells of an incident in 1889. 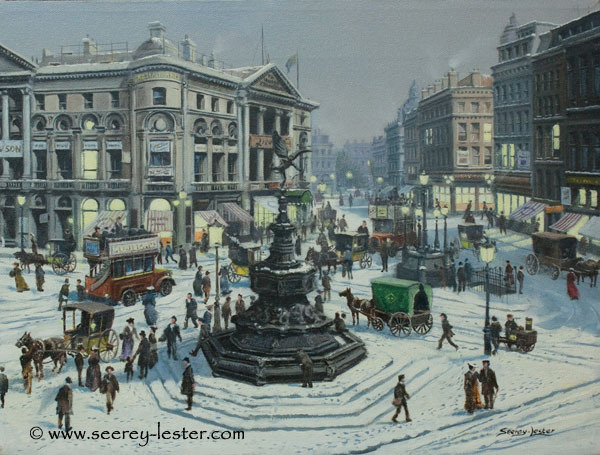 This early painting of Edwardian London, by John, might well make it into his new book to accompany a story of Theodore Roosevelt's visit to England in 1914. Just off John's easel and destined to appear in his new book. 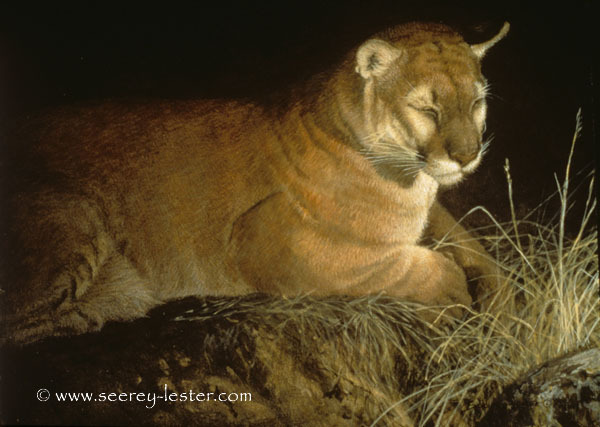 This painting of John's, depicts what Edmund Heller, a member of Theodore Roosevelt's 1909 African safari, saw one night from his tent - his worst nightmare. Read the full story in John's new book. NEW off John's easel. In 1885 Theodore Roosevelt stormed into a publisher's office on Broadway, New York. Find out why and what happened next in John's new book. 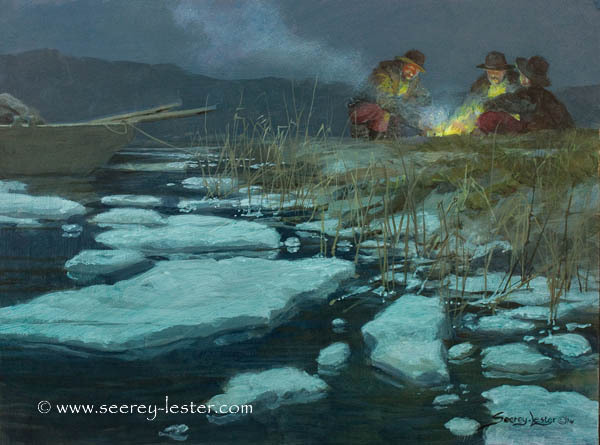 This painting will appear in John's book along with the harrowing story of Roosevelt's journey down the River of Doubt in 1913. 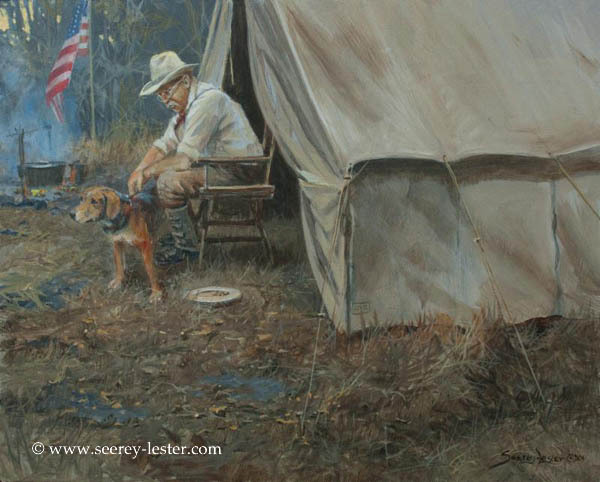 This painting will appear in John's new book along with a story about Theodore Roosevelt's encounter in the 1880s while camping. 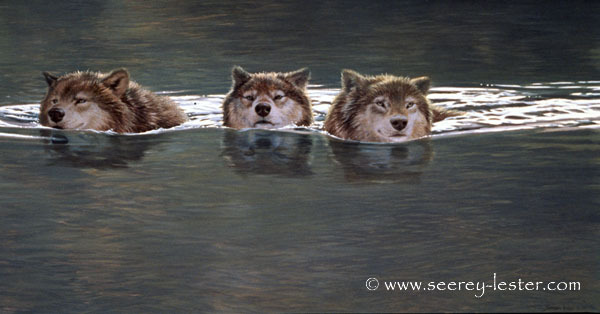 This painting will appear in John's new book. New painting off John's easel. 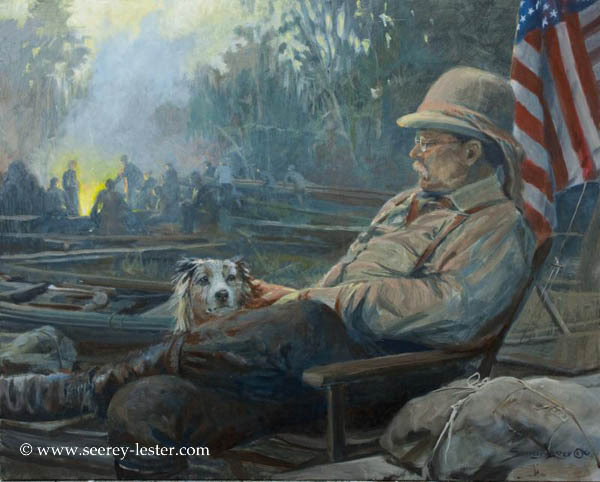 This painting of the dog Skip hitching a ride with Theodore Roosevelt, is destined to be the cover of John's new book. 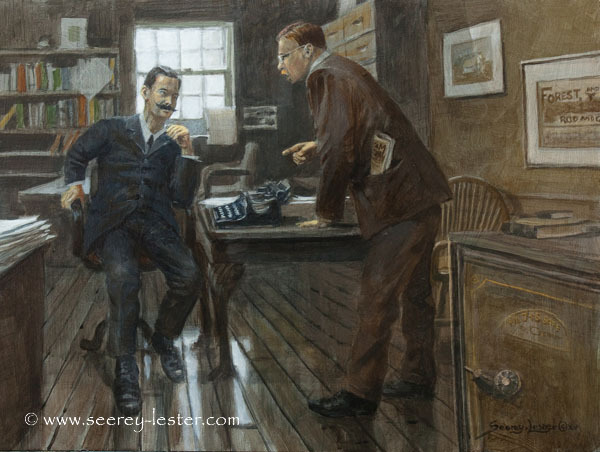 This painting depicts an incident In 1886, when three thieves stole Theodore Roosevelt's boat. You can read the amazing story of how TR brought them to justice, in John's book. 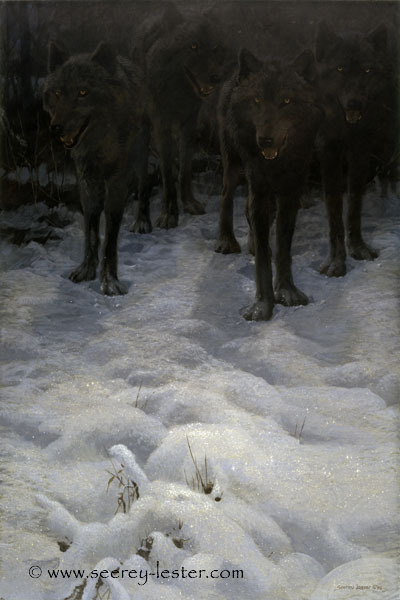 In the 1880s Theodore Roosevelt had a scary encounter with wolves. Read the full story in John's new book. 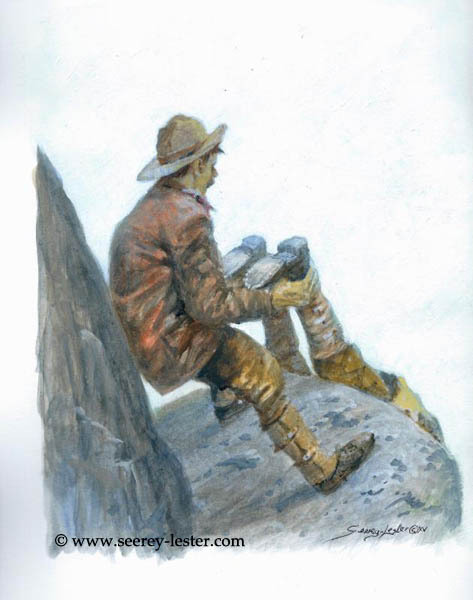 This painting of Johns, will appear in his new book along with another story about Theodore Roosevelt's hazardous journey down Brazil's River of Doubt, in 1913/14. In 1901, Theodore Roosevelt took one of the most important and historic rides of his life. The full story will be in John's new book.